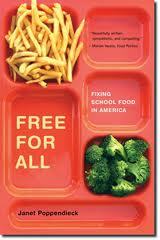 The publisher of Free for All: Fixing School Food in America contacted me right after I posted about starting up the book club and offered to giveaway five copies to readers of the blog! How cool. Like I posted last week, we’re going to spend most of January acquiring the book (through the library, bookstore, online, or the giveaway) and starting to read it. Moving into February, I’ll start posting discussion questions, to keep us going. Word of warning: this is not light reading. Janet Poppendieck must have researched and written for years to compile and organize the information for the book. The only time I find to read is at night, before bed. I’m going to put a highlighter on the bedside table so I can keep track of all of her quotes, statistics, and other information. If you want to enter the giveaway and read along, please comment below by Friday January 7th! I’ll choose winners using random number generator. Thanks for doing this. I love the book group idea. And I'd love a copy of this book! Would love a copy! I can't buy it right now. Not enough funds. My library does not have a copy either. 🙁 Maybe I'll get lucky & win a copy. Thanks! Great give-away! Good luck with the book club. I would love some new ideas for school lunch! Our school doesn't have a hot lunch program, and it gets hard trying to come up with ideas! I'd love to get in on this! I work for a community garden initiative in Southwestern Ohio and am looking for ways to get more fresh produce into local schools. This sounds right up my alley! Sounds like an interesting read. I'd love to win a copy and read along and discuss. That looks like a really interesting book….thanks for the opportunity! I was planning to head to the library to join in, but wouldn't mind my own copy! This future teacher (I'll graduate in February) is super interested in school food and how it relates to student classroom performance. I love your blog and I'd love this book! I love your blog and would love a copy of this book! I want in on the book club! I would love a copy – my library doesn't have it yet. This would save me from having to order it! I would love to read this. I just spent the past week reading your blog from the beginning (very cool to see your journey from the beginning.) It made me realize that we have it pretty good in our school (our cafeterias cook mostly from scratch and we even have recess every day and PE 3-4 times a week!) But, there is always room for improvement so I would love to read about what I can do to make things even better. Thanks to everyone who entered!! I'm going to close comments and announce the winners on MONDAY!! I love following your blog and would love to have a copy of this book to read!! !